Imagine a city with blue skies and clear roads, populated by healthy people commuting on quiet, non-polluting buses. That’s how the business magazine Fast Company envisions the perfect city, and it’s borrowing some ideas from Oakland. Fast Company recently highlighted AC Transit’s alternative fuels program as part of its yearly “Fast Cities” list of the best in urban innovation. AC Transit is based in Oakland and covers Alameda and Contra Costa counties. Since 2005, Fast Company has compiled an annual list of the top cities to live and work in the United States—this year with a spotlight on social entrepreneurship and sustainable business. The 2010 list of 12 great ideas cultivated in as many U.S. cities was published in the magazine’s May issue. Along with Oakland, Austin, Texas was chosen for its car-share program for city employees, Boston, Massachusetts for its commitment to securing housing for artists, and San Francisco for its policy of sharing public information with software developers. On Tuesday morning, Fast Company hosted a breakfast in downtown Oakland to showcase some of the best ideas in town for a sustainable metropolis, including AC Transit’s Alternative Fuels Policy and Marketing program. Other featured guests from Oakland’s business community included First Solar, the world’s largest maker of thin film photovoltaic solar modules, Revolution Foods, which cooks up healthy school lunches for Bay Area schools, and the nonprofit Ella Baker Center, a pioneer in the green jobs movement. Siemens Industry, which is building zero-emission light rail vehicles in Sacramento, sponsored the event. The breakfast was held in a small conference room at the Washington Inn in downtown Oakland. Around 40 guests—many of them Oakland-based social entrepreneurs—exchanged business cards and chatted about their respective ventures before the featured companies began their presentations. The public transportation agency plans to add 12 new fuel cell buses to its fleet by the end of the year, according to Jaimie Levin, AC Transit’s alternatives fuels director. If used to replace diesel buses, each fuel cell bus could keep 120 tons of carbon dioxide from entering the atmosphere every year. AC Transit’s hydrogen fuel cell program has caught flak in recent years from some alternative energy and public transportation advocates who say the technology is too costly for widespread use. They say precious funds should go toward expanding public transit and use of cheaper clean technologies. But Levin was quick to point out Tuesday morning that the program is funded entirely with federal, state and regional grants and private partnerships, not with the agency’s operating funds. “Our users are not interested and cannot afford to pay the cost of pursuing this esoteric technology,” he said. AC Transit has raised over $75 million in grants for the program. AC Transit has also become the first public transit agency in California, and one of the first in the nation, to join The Climate Registry (originally called the California Climate Registry)—the precursor, proponents hope, to an eventual North American carbon cap and trade system. The Climate Registry is a nonprofit collaboration among over 200 government agencies, corporations and Native Sovereign Nations in the U.S., Mexico and Canada. It sets standards for calculating and reporting greenhouse gas emissions and compiles emissions data from participants into a single registry. Levin said having certified, accurate information about carbon emissions helps establish the agency’s green agenda when applying for grants, and someday AC Transit might be able to sell carbon offsets from its emission-reduction programs. But the main objective is simply to start keeping track of the agency’s emissions, he said, because someday they might have a cost. Other speakers at the Fast Company breakfast rounded out the magazine’s picks for good ideas for a healthy, sustainable future. James Cook, Director of Business Development at First Solar, spoke of the 550-megawatt solar power plant that the company is building on former farmland near San Luis Obispo. First Solar established its California headquarters in Oakland last year, and now employs 55 people at its downtown office. The company makes solar modules mostly for use on commercial buildings and solar energy farms. Cook said his and many other solar companies have flocked to California in recent years, attracted by the state’s greenhouse gas reduction and renewable energy mandates. Ian Kim, the director of the Ella Baker Center’s Green Collar Jobs Campaign, spoke in glowing terms of the economic potential of green industry, proven, he said, by its performance during the current recession. “The green economy was the last to freeze and has shown itself to be the first to thaw,” said Kim. In fact, revenues in the solar industry—one of the pillars of green industry in California—grew 36 percent in 2009, according to the industry group Solar Energy Industries Association. California had more solar capacity installed last year than anywhere in the nation. In the Bay Area, 130,000 people are employed in the green economy, according to the California Employment Development Department, and California has a total of 600,000 green jobs. Of the 84 students who completed green jobs training at the Cyprus Mandela Training Center in West Oakland, one of the Green Jobs Corp partner centers, 54 have been placed in full-time positions, according to Art Shanks, executive director of the center. The challenge, said Kim from the Ella Baker Center, is to ensure green jobs are good paying, stable and available to minority and disadvantaged residents who need them. “How do we ensure that the full diversity of Oakland and California are not just trying to catch up or keep up with the climate gap, with the green divide, but are actually a core part of leading the green revolution that we all need to invest in?” asked Kim reflectively. A threat to California’s green industry potential, said Kim, will appear on the ballot in November. On Tuesday, Secretary of State Debra Bowen announced that an initiative to repeal the State’s greenhouse gas reduction law, Assembly Bill 32, gathered enough signatures to reach the polls. The initiative would delay implementation of AB 32 until the state’s unemployment rate drops to 5.5 percent, from its current 12 percent, for four consecutive quarters. A presentation by Revolution Foods closed the event. Revolution Foods prepares and delivers 17,000 healthy, all-natural school lunches every day for Bay Area schools—mostly charter schools and small public districts. The company employs over 100 people in Oakland at its culinary center off of Hegenberger Road. Cain said around 80 percent of meals sold by Revolution Foods go to low-income students who quality for free or reduced lunch. Still, he conceded that the company’s price is out of reach for many larger school districts, which maintain their own kitchens and staff for preparing meals. “If [schools] can save money on food and put that to another teacher, that’s a hard decision for them to make,” Cain said. Still, he said the company has been able to leverage its growth to form partnerships with suppliers willing to provide quality products at cost. In the audience, other social entrepreneurs shared a vision of Oakland’s future as a nexus for socially responsible business. “I think Oakland has great potential,” said Baba Afolabi, who is soon to launch an Oakland-based clothing business with a mission to “embody multiculturalism,” according to its website. Check out the other cities highlighted by Fast Company. 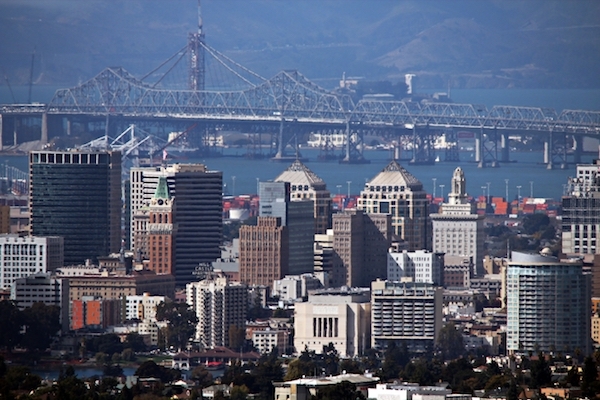 Want to get updates on the latest news from Oakland North? Join us on Facebook. Fast Company business magazine held a breakfast Tuesday in downtown Oakland to highlight the best local ideas for a sustainable future.